Bike and pedestrian connectivity is a great way to enhance quality of life and create healthy, thriving urban communities. This is why PEC is teaming up with the Thomas Jefferson Planning District Commission to build support for a comprehensive greenway system in the Charlottesville and Albemarle urban area. The greenway effort is focused on the City of Charlottesville and the Albemarle County urban area that directly surround the City. “These locations have an opportunity to create a world-class bike and pedestrian system that connects neighborhoods, retail areas and places of work with iconic resources such as Monticello, the Downtown Mall, UVA Grounds, the Rivanna River and Biscuit Run State Park,” says Rex Linville, our Albemarle County field representative. There are many benefits that come from creating greenways, including improved health and wellness, expanded transportation options and greater economic development opportunities. As the TJPDC is currently engaged in a re-write of their regional bike and pedestrian plan, this effort is designed to directly tie into their work and significantly expand the outreach component of their effort. The collaborative project is being funded with a two-year grant from the Charlottesville Area Community Foundation that has allowed us to hire Peter Krebs as the community outreach coordinator for the effort. "I'm excited to work with PEC, TJPDC and CACF on a topic I'm very passionate about — connecting people and communities with opportunities to live better, healthier and more prosperous lives," says Peter. Within the first year, we will primarily focus on outreach, collecting community feedback and coalition building. Then, the focus will shift more to implementation and funding. As younger generations look toward urban areas as a prefered place to live, it is even more vital that communities invest in the amenities and infrastructure that connect people with the places they live, work, play and shop. 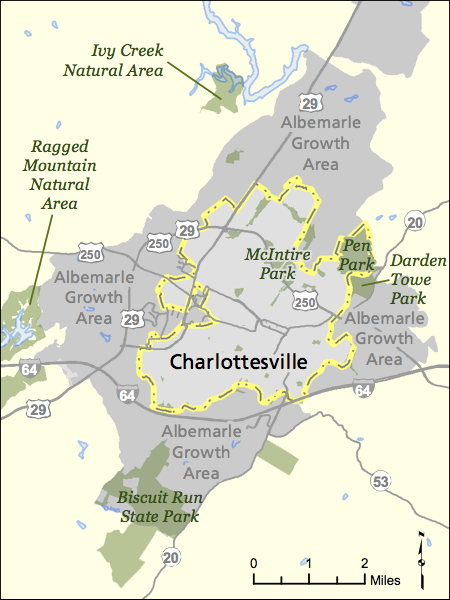 “Charlottesville is increasingly seen as an incubator for innovation. As the businesses leading this charge look to attract and retain new talent, we need to offer amenities that help the region stand out from the crowd. Ensuring that the urban core is connected with bike and pedestrian greenway corridors is a great place to start,” says Rex. This article was featured in our Fall 2017 Member Newsletter, The Piedmont View. You can read more of the articles on our website or view a PDF of the issue.